Looking for fast, affordable, high-quality print, copy or sign solutions? You’ve come to the right place! Located in Torrington, Connecticut, we service customers from all around Litchfield County and beyond. Our experience as a print shop for over 35 years has given us the foundation and insight to ask you the right questions and offer you the best solutions for your specific needs. Our graphic design experts can even work with you to create the perfect look. 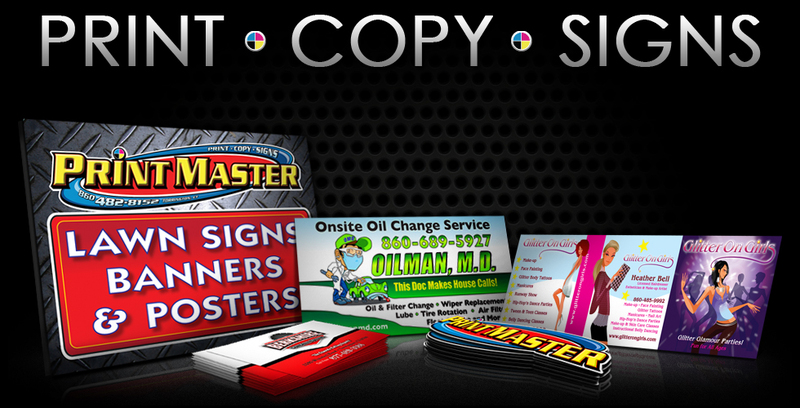 Whether it's printing, copies, or any kind of signage - Print Master has the tools, experience and know-how to meet all of your printing, signage, and promotional needs. It’s time to get your projects started. Call us today to talk to a Print Master representative. You’ll be glad you did.